Multi-tools give you many uses in one easy-to-carry tool. Weighing little enough to take around with you, they give you resources you might suddenly need. These are handy things which are built on the shape of a pair of pliers or a knife. They include scissors, bottle openers, screwdrivers, and other tools. There are even some without knives which can be taken through airport security. Multi tools are great in many situations! In a hurry? Here are the best-selling multi-tools right now. And here is a link to the Leatherman Wave, arguably the Best Multi-Tool ever. How to Ease Too-Tight Tools? So, What is the BEST Multi-tool? Want to explore further? Here are the current best-selling multi-tools at Amazon. Leatherman, Gerber, and Victorinox (Swiss Army) are three of the main brand names. There are other good brands and many imitation multitool brands as well, but I didn’t get into them. These top brands come in a variety of sizes, price ranges, and tool selections. The featured image in the top left of this article is my husband holding the Swiss Army knife he has used for over 20 years, and it’s still going strong. The Leatherman tool company tells us that their most popular multi-tool for years has been the Wave. It’s in the midrange of prices and offers tremendous value for the money. The original Leatherman Wave was replaced by this back in 2004, so this one is still sometimes called the New Wave. It is made up of 17 tools: Needlenose Pliers, Regular Pliers, Wire Cutters, Hard-Wire Cutters, Clip-Point Knife, Serrated Knife, Saw, Scissors, Wood/Metal File, Diamond-Coated File, Large Bit Driver, Small Bit Driver, Large Screwdriver, Ruler (8 inch/19 cm), Bottle/Can Opener, Wire Stripper, & Lanyard Attachment. Despite all that power, it’s about 4 inches long and 2 inches thick. Weight about 8.5 ounces, which is to say about half a pound. It’s made of stainless steel. Every tool can be opened and operated with one hand, and most of them lock into place. The Leatherman Tool Group began business in 1983, when Tim Leatherman and a friend started out with the PST or Pocket Survival Tool. They now have dozens of tools and a very generous 25-year repair policy. Their tool designs fall into two categories: ones based on pliers, which is what they started with, and ones based on on knives. On their website you can read good tips on how to maintain your multitools. Here are four of the currently most popular Leatherman Multi-Tools at Amazon, all with those 25 year warranties. There are many favorable reviews for each of them. These all cost less than half the price of the Wave, but are still very good for daily use. The Leatherman Wingman Multi-Tool, Stainless Steel is at this moment the best-seller of all multitools on Amazon.com. The Wingman has 14 tools: spring-action needlenose pliers, spring action regular pliers, wire stripper, 420HC combo knife, spring-action scissors, package opener, ruler (1.5″), can opener, bottle opener, wood/metal file, phillips screwdriver, medium screwdriver, and small screwdriver. What doesn’t it have? A wood saw, for one thing. Weight just under 7 ounces. It has a clip for attaching to belt or pocket. The knife is easy to get to in the Wingman, and the scissors are good. Overall, a good collection of tools for the affordable price. The Leatherman Sidekick Multi-Tool, Stainless Steel with Nylon Sheath Now we’re up to 17 tools! Needle-nose pliers, regular pliers, 154CM replaceable wire cutters, 154CM replaceable hard-wire cutters, electrical crimper, wire stripper, 420HC knife, 420HC serrated knife, saw, awl w/ thread loop, ruler (8″, 19cm), can opener, bottle opener, wood/metal file, phillips screwdriver, large screwdriver, small screwdriver. Just under 7 ounces. Knife can be opened with one hand. The knife and the saw blade lock open. The Leatherman Skeletool Multi-Tool, Stainless Steel You can get this with an optional sheath, listed on the same webpage. It has seven tools: : needlenose pliers, regular pliers, hard-wire cutters, wire cutters, 420HC combo knife which opens easily, carabiner/bottle opener, and large bit driver. Weighs only 5 ounces, making it convenient to have along with you. A carabiner and another clip makes it all the easier to carry. Great for daily life, but you might want more devices on a camping trip. Leatherman Micra Multi-Tool, Stainless Steel Available in blue, green, black, gray, red, and stainless steel, this is a few dollars less than the others, and it’s also a good bit smaller. I like colorful tools that are easy to locate in a jiffy. The Micra has ten tools including some personal care items: 420HC knife, spring-action scissors, flat/phillips screwdriver, ruler (4.7in, 12.0cm), nail cleaner, tweezers, bottle opener, nail file, medium screwdriver, extra-small screwdriver. Weighing less than 2 ounces, it’s the most popular Leatherman mini-tool, partly because people tend to like its scissors. Can go on a key chain as well as in a purse or small container. Here’s an interesting review comparing the the Wingman and the Sidekick, on a site devoted to multitools. Gerber started out in 1939 as a knife company and now makes a variety of tools. As I looked around their website, I liked their page on how to use a knife safely, tips which would apply to multitools as well. Around the internet, I kept coming across mention of the Gerber Diesel. For example, it was called the most user-friendly multi tool in one place, and somewhere else I read that it’s one that older kids can figure out. It comes in black or stainless steel, and the tools it contains include: Needlenose pliers, Wire cutter, Partially-serrated knife blade, Cross point screwdriver, Small, medium, and large flat blade screwdrivers, Can opener, Bottle opener, File, Saw, and Scissors. Every component locks in place for more secure use. Here’s another popular Gerber Multi-Plier: The 9 ounce Gerber Suspension Multi-Plier [22-01471] comes with these 13 tools: Needle-nose Pliers, Wire Cutter/Stripper, Straight Blade, Serrated Blade, Phillips Screwdriver, Large and Medium Flathead Screwdrivers, Scissors, Bottle Opener, Can Opener, Saw, Awl, and Lanyard Ring. Quite a useful collection, and the many reviews reflect that view. As the name and its appearance suggests, the pliers are emphasized. If you have small hands, as I do, this one may be a bit much for you, or you may get used to it. 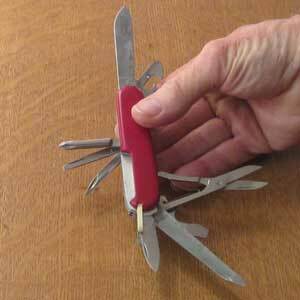 My first Swiss Army knife went all over Europe with me when I was a young backpacker. Mainly it served culinary purposes but it was also handy for repairs. Here are four of the most popular Swiss Army pocket knives. If you click through to Amazon, all four of these will take you to webpages at Amazon.com where you have choices, of what tools are in the knives or what colors they come in. Because of that, I’m not listing all the many features for each knife here. Founded in 1884, Victorinox is the largest manufacturer of pocket knives in the world. They bought out another Swiss Army company, Wenger, in 2005. Victorinox also make cutlery and some other things. For example, their line of CyberTools are Swiss Army knives particularly good for working on computers and eelctronics. They make Multi Tools as well. Here is a link to their line of SwissTools. A Leatherman mini multi tool good on keychains is the Squirt ES4 (click on the image on the left, above). It’s given the name Squirt because it is tiny, even smaller than many car keys, but its tools are versatile and sturdy for their size. But the Gerber Dime is much more popular with tool bloggers than the Leatherman Squirt, in the keychain tool market. For example, the long Gerber Dime Review is no Gerber fan overall but the writer likes the Dime a lot. And here is an amusing comparison of the Leatherman Squirt vs the Gerber Dime, which the Dime wins easily. Both tools come with black, blue, or red handles, and Gerber also offers green. The Dime costs noticeably less than the Squirt does, and it’s more comparable in price to the Leatherman Micra. I’m thinking of getting both a Dime and a Micra, seeing which one I prefer for EDC (every day carry), and using the other one as a gift. With many fliers preferring not to check luggage, and with regulations against knives on airplanes, some of the tool companies have manufactured multitools without knives that travelers can take with them. Probably most of the people don’t use these tools much on the planes, but they do want the versatility of having them at their destination. Of course, regulations and their enforcement can vary somewhat, but here is the TSA page regarding what isn’t permitted… the tabs marked Sharp Objects and Tools are the most pertinent. Leatherman has a webpage with images of tools where it says These handy multi-tools follow TSA specifications so you can carry the right tool for the job by air, land or sea. The TSA agent has the final say, and Leatherman states on its FAQs page, Leatherman does not warranty tools that are lost, stolen, or confiscated. Be sure you get the travel-friendly versions. These links will take you to ones that were permissible at the time I wrote this. And here is a link to the search for TSA Approved Multitool at Amazon. Quite a few were listed! Which scissors on multi-tools are the best? This mattered to me and it was something I found a lot of opinions on as I surfed the web. I also found that scissors were one of the most popular tools to have along. The Leathermade Squirt and the Gerber Pro Scout were both recommended around the web as the best multitools with scissors. The scissors on the Gerber are Fiskars, a very good brand. Which is the best multi-tool? That depends completely on what it’s needed for. If you are an EMT, or go fishing a lot, or fix computers, for example, you will know what tools you are going to need at your fingertips. If being able to open certain tools one-handed is important to you, watch for that feature. It gives you some extra speed, more important in a breaking crisis than when you are just fixing something. The Leatherman Wave is mentioned as the most popular by quite a few people around the internet, and it’s recommended as a good one for a gift. It was considered the best multi-tool in a poll conducted by Lifehacker, garnering over a third of the votes, with the rest of the votes going to quite a variety of devices. The Wave is at a good price for the 17 tools you get. While more men than women include one in their “everyday carry” supplies, they are useful for everyone. I think most people would like to receive a multi-tool gift chosen to suit what they are likely to use. And the price can be right, too, from under $20 to a lot more than that. As a former librarian, I read and read about anything that interests me. Throughout this page, I’ve linked to some of the places I found useful. The manufacturers have websites you can find easily too. As a long-time webmaster, I do love finding really good websites and giving them a shoutout. I immediately recognized the thoroughness and skill here. The whole site, rangermade.net, is full of reviews for the outdoor life and for surviving whatever may come. Kudos! I also liked this buying guide at another site… and here is another multi-tool review on a well-done site. And here’s an image for Pinterest, if you are into that! My husband has had his for years… the one shown in the article. I don’t know what happened to the one I had so many years ago! Glad you liked the video… I did too. This company makes theirs in the US, but not all the companies do. Interesting little tool and I enjoyed the video about how they make them. I like too that they are made in the US. I love my Swiss Army knife. So handy!